Morning Sun, Afternoon Shade – An area in your garden that the sun is blocked for much of the day, mainly between 1:00 p.m. and 6:00 m. Typically found in established gardens where mature trees block out the sun all but for a very short period of time early or late in the day. North facing exposure can generally be classified as partial shade. There are some plants, in our experience, which really do best in full shade. Cast Iron, Edgeworthia, Hosta, Ferns, Aucuba, and Fatsia. Other shade plants will be fine in full shade, but those listed here actually NEED it. For a complete list of shade loving annuals, perennials, shrubs and trees click here. Shaded areas usually lack adequate moisture as the rain is blocked by a canopy of trees, and tree roots absorb most of the water. Shade gardens need regular watering even during rainy periods. For shrubs and trees, a drip system is recommended. The more sun a shade plant gets, the more water it needs. In South Carolina, warm climate shade plants can grow actively all year round so they must be fed a complete fertilizer in early spring and summer. To keep your garden growing for many years, remove low-hanging branches from trees that tend to keep your gardens hidden from view and prevent adequate air flow. Most shade plants want some sun (morning or filtered). Flowering plants, especially, need some sun in order to produce flowers. While summer is now upon us, turn to your shade loving areas to escape the scorching summer sun and enjoy the lush green plants that thrive in our area. 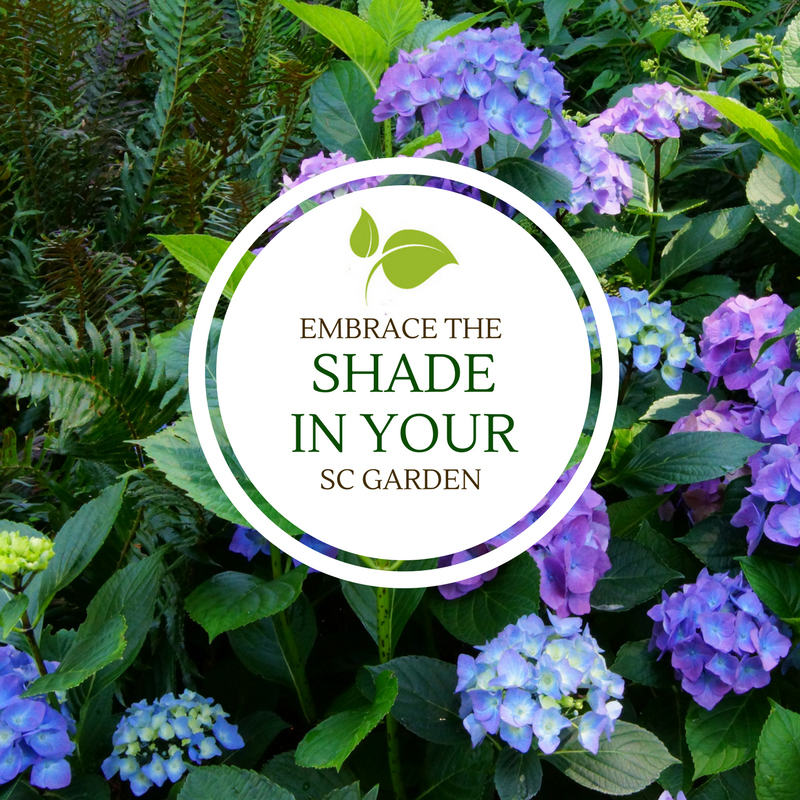 Once you’ve discovered all the shade loving beautiful annuals, perennials, trees, and shrubs suitable for shade gardening you may never want to fight the sun again.